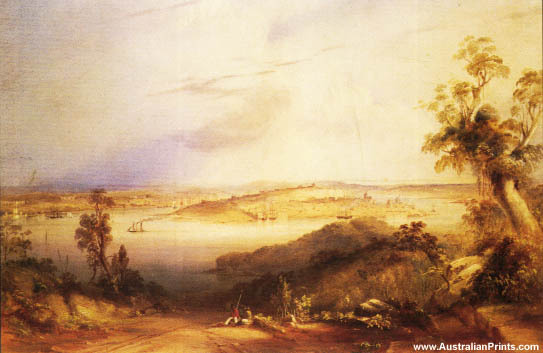 Conrad Martens was an English-born landscape painter who is best remembered for his watercolours of Sydney Harbour. Conrad Martens (London 1801 – 21 August 1878) was an English-born landscape painter active on HMS Beagle from 1833 to 1854. 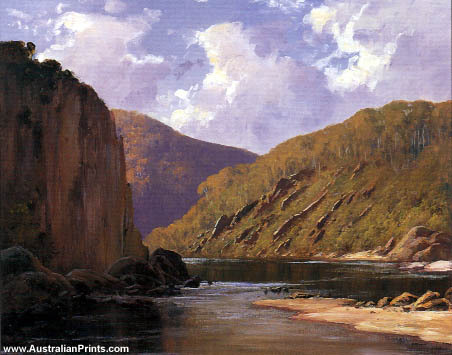 He arrived in Australia in 1835 and painted there until his death in 1878. Best remembered for his watercolours of Sydney Harbour, Conrad Martens was born in London and arrived in Sydney, after extensive travels, in 1835. The two greatest influences upon him as an artist were his training in London under Copley Fielding and his appointment as ship’s artist and topographer on Charles Darwin’s scientific voyage aboard “HMS Beagle”. From Copley Fielding, Martens learnt his love and mastery of the picturesque landscape style exemplified by Claude Lorrain and Joseph Turner. From Darwin and particularly from the commander of “The Beagle”, Captain Fitzroy, Martens acquired a concern for precision and scientific observation of clouds and other meteorological phenomena. Artist information page for Conrad Martens. This article uses material from the Wikipedia article Conrad Martens, which is released under the Creative Commons Attribution-Share-Alike License 3.0.